Particle size and air purification. Fine particles are the reason why air pollution is the leading environmental threat to human health. But what are fine particles? Many people have heard of PM 2.5, but what does it mean? PM is an abbreviation for Particle Matter which is a mixture of solid particles and liquid droplets found in the air. And 2.5 refers to the diameter of the particle in microns, which is 1 millionth of a meter. 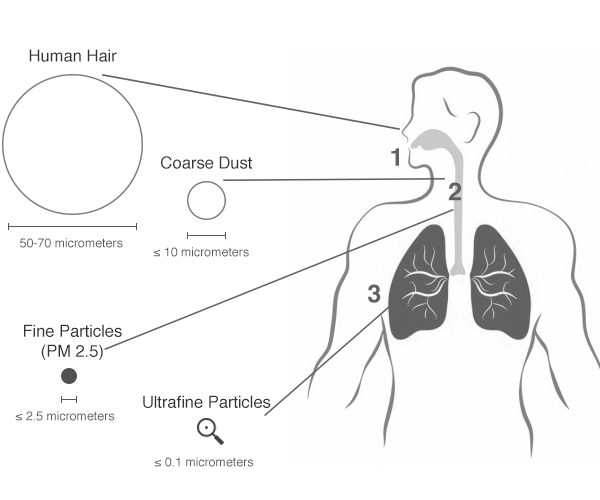 Particles smaller than PM 2.5 or particles with a diameter of generally 2.5 microns or less are called fine particles. Although they are not visible to the human eye unless they accumulate, most of the particles that deposit deep in our lungs and enter our bloodstream are even smaller than these so called fine particles. These extremely small particles, PM0.1 and below, particles with a diameter 0.1 microns or less, are called ultra-fine particles or nano particles. Research have shown that these particles represent more than 90% of all the particles indoors making it crucial for air purifiers to catch these particles if they are to have any significant effect in cleaning the air in your room. Unfortunately most HEPA based air purifiers only catch PM0.3 and some down to PM0.1, leaving over 90% of all particles in your indoor air. Smog, traffic pollution, virus, combustion from coal power plants, mold mycotoxins are all finer than PM0.1. These particles cause severe health problems such as cardio- and vascular disease, COPD, cancer, and asthma. 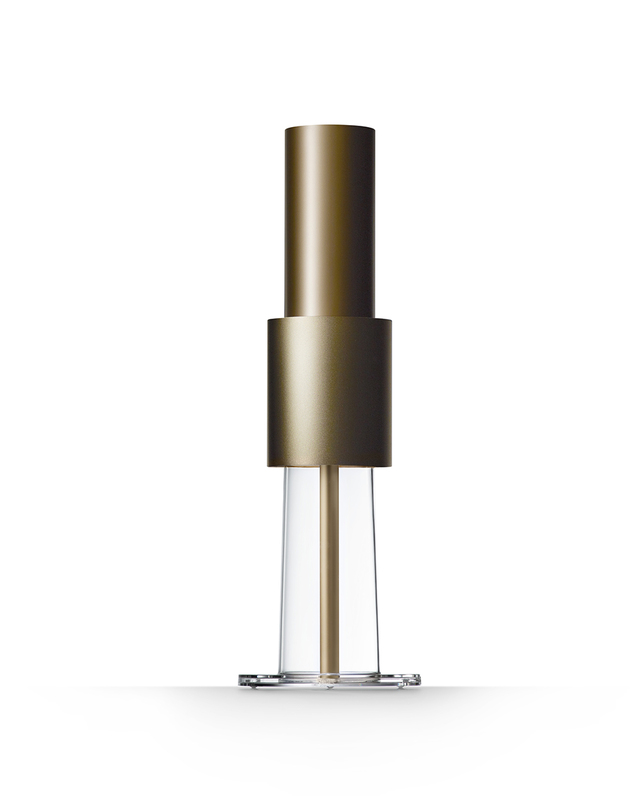 LightAir’s products were developed with the outset of removing the finest and most harmful particles. 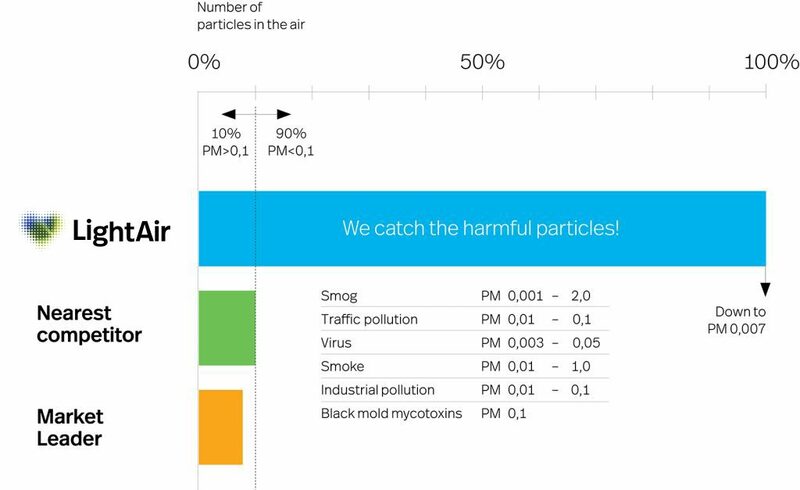 According to third-party governmental tests, LightAir’s products remove particles all the way down to PM 0.007 meaning that we keep your air virtually free from the harmful particles you want to avoid.